Willowtown, Plan to attend and have you voice heard. 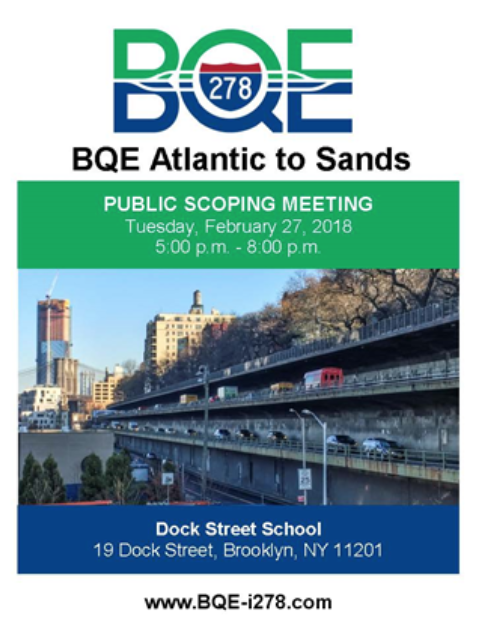 The New York City Department of Transportation (NYCDOT) is holding a Scoping Meeting and preparing a Draft Environmental Impact Statement (DEIS) consistent with New York City Environmental Quality Review (CEQR) regulations for the replacement or rehabilitation of the BQE / I-278 from Atlantic Avenue to Sands Street. During the Public Scoping meeting, a presentation at 5:30 p.m. will be followed by public testimony taken on the Draft Scope of Work. The purpose of the scoping meeting is to provide the public with the opportunity to comment on the Draft Scope of Work proposed to be used to develop an EIS for the proposed Brooklyn-Queens Expressway Rehabilitation/Replacement project.This is your chance to speak directly to the engineers and designers who will be making final decision that will affect Willowtown for years to come. The Willowtown Association stands with Senator Brian Kavanagh and Assembly member Jo Anne Simon working to authorizing the streamlined design-build process in Albany to protect Brooklyn neighborhoods, and save taxpayer dollars. You can also learn more by attending the BHA Annual Meeting on Feb. 28 th. The Draft Scope of Work is available for review online at www.BQE-i278.com and at select public locations, including the Brooklyn Public Library Main Branch. Public comments are requested with respect to matters to be addressed in the Draft Environment Impact Study.